PVC Union Covers are thermoformed PVC covers designed to insulate pipe unions and connectors that protrude out past the adjacent pipe insulation. Each PVC Union Cover comes with a rectangular fiberglass insert which is first wrapped around the union and then the PVC Union Cover is installed over the insulation. PVC Union Covers are two piece fittings (comes in two halves) which are either tacked, taped, or glued together during install. 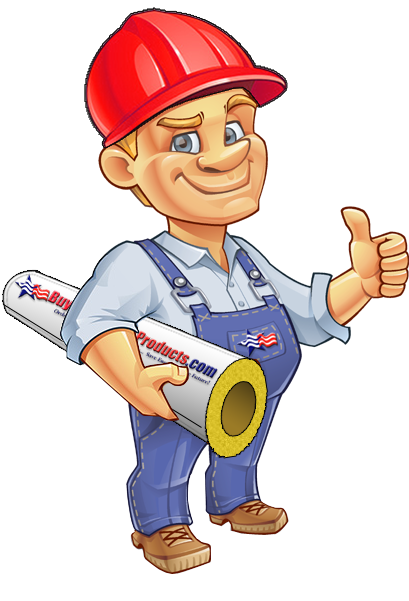 The two halves of the PVC Unions are designed to have a large overlap to allow easy install and hassle free adjustment to the outside diameter of the pipe insulation. *Tacks, Vinyl Tape, and Adhesive are sold separately. Union Covers are available in sizes #7 through #19. Quality product, lowered my boiler run time. The PVC pipe covers look so much neater and cleaner than the old method! Makes the basement room feel clean and finished. Quick and easy to install. I'll be purchasing more for the rest of the basement. Fit very well. Came with alot of insulation. Recommend buying the special pins to secure the cover. I overlooked all 4 of the unions the pipes had in my basement when first placing my order. Once I started popping the insulation sticks on the pipes I found that all these unions were too big to go over. I spoke to a very helpful gentleman who walked me through all my options and recommended the union covers since they were the easiest option I had. I am glad I took his recommendation as they were easy to install and look great. Only did a couple, but they were easy to install, and the result looks good. The PVC covers are a great companion to the pipe wrap. Learned to trim with sharp scissors for a tight fit. The push pins are sharp and effective. Nice finishing touch to your insulation job. Pretty easy to install, and fits perfectly. This adds a nice finished look to the piping system. I used pop rivets to secure it. Click the button below to add the PVC Union Cover to your wish list.